The Patriots' 25-point comeback in Super Bowl LI is tied for fifth in NFL history. Which games could possibly top that? It’s been more than a day later and we’re still trying to wrap our minds around just how the New England Patriots beat the Atlanta Falcons in Super Bowl LI after falling behind 28-3. The scrutiny of the comeback (or collapse, if you will) will go on for the following days, weeks, and months all the way until kickoff of the 2017 NFL regular season. In the midst of the commiserations and celebrations, it’s worth taking just a few moments to pause and reflect on how historic a game and a comeback this was. The odds of seeing a 25-point comeback in an NFL game are already astronomical to begin with. But for it to happen in a Super Bowl? You would need an advanced statistics degree from an Ivy League school to try to put that into perspective. Or just a really, really, really strong calculator. The Patriots’ Super Bowl LI comeback against the Falcons, at a 25-point deficit, is tied for the fifth-largest in NFL history with two other games. On Oct. 5, 2014, the Browns overcame a 25-point deficit to win on the road against the Tennessee Titans. Yes, it’s hard to believe Cleveland actually accomplished something positive this decade. And in November 1987, the St. Louis Cardinals led by Neil Lomax turned around a 25-point lead held by the Tampa Bay Buccaneers. Ironically, all three of these games were comebacks from a 28-3 score. Just four games in NFL history featured larger comebacks than Super Bowl LI. Here they are. You likely know about the No. 1 comeback on our list being achieved by the Buffalo Bills, but you probably didn’t know that they also hold the No. 4 comeback in NFL history. It came just a few years after their famous comeback against the Houston Oilers in a regular season game against Jim Harbaugh’s Indianapolis Colts. The Colts took a 26-0 first-half lead before the Bills (led by the immortal Todd Collins after Jim Kelly’s retirement) began storming back. Buffalo went on a 37-3 scoring run to take a 37-29 lead into the closing minutes. Indy actually scored a touchdown to make it 37-35, even after Harbaugh was replaced by Paul Justin. However, the two-point conversion failed and the Bills held on for a historic win. Fun fact: the 1997 Colts went 3-13 on the season and then drafted some guy named Peyton Manning to be their quarterback in 1998. Speaking of bad teams blowing big leads, the 1980 New Orleans Saints hold the ignominious distinction of not only going 1-15, but also blowing the biggest regular season lead in NFL history. The Saints led 35-7 at halftime thanks to three touchdown passes from the great Archie Manning. Then the legend of Joe Montana was born. Before he won all those Super Bowls, Montana led the 49ers to what at that time was the biggest comeback in NFL history. Montana led the 49ers to 31 unanswered points with the game-winning field goal coming in overtime. It was just the first of many magical Montana moments in San Francisco. This “wild” Wild Card Game from just a few years ago between the Colts and Chiefs was quite the shootout. After scoring a touchdown off an Andrew Luck interception, the Chiefs led at Indy by a score of 38-10. And yet, the Colts had Luck on their side both literally and figuratively. Andrew Luck led the Colts on five second-half touchdown drives. While his 64-yard bomb to T.Y. Hilton gave the Colts enough points for a 45-44 victory, the play that will be most remembered was his fortuitous fumble recovery for a touchdown in the fourth quarter. Before you ask — no, this website was not secretly founded by Bills fans. However, it is appropriate that a website named The Comeback would honor a game that was made famous with the same name. Bubba McDowell’s pick-six gave the Oilers a 35-3 lead early in the second half, but the Bills would follow with 35 unanswered points to take a 38-35 lead. The part of the game you may not remember is Oilers kicker Al Del Greco actually forcing overtime with a field goal in the closing seconds. Alas, Warren Moon would be picked off in overtime and Steve Christie would slot home the game-winner for a 41-38 victory. 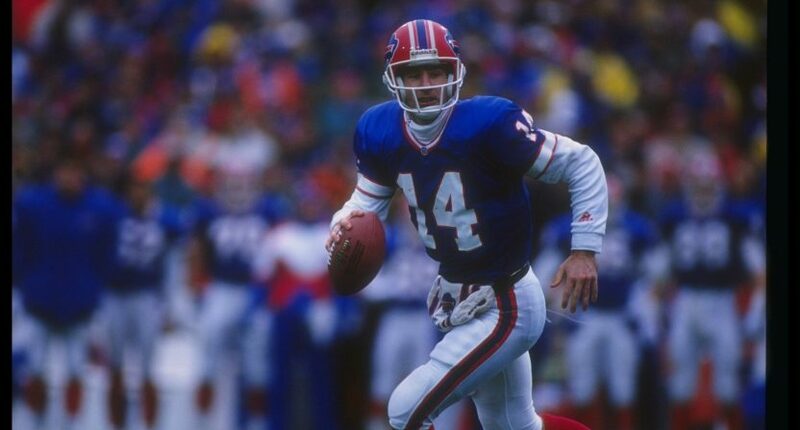 The Bills’ victory over the Oilers in the 1993 NFL Playoffs just might be the most famous single-game comeback in all of professional sports — at least until this past Sunday. The Bills’ comeback was larger, of course, but the Patriots’ comeback came on the biggest stage of all. So which one was truly greater? Just a new NFL debate topic to get us to August, I suppose.